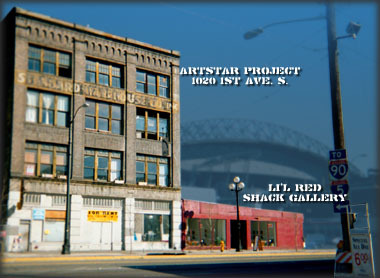 The Safe Haven Project Inc.
Were a place that offers artists affordable workspace. We sponsor an artist-driven gallery. Were developing programs that extend the arts and artists into the greater community, and, by doing these things were hoping to create a community in which the arts and artists can flourish. Were a place for artists to meet and exchange ideas, to create art affordably and offer the possibility for public exhibitions. We also enable artists to work in a supportive environment thats deeply committed to the greater Seattle community. Our community consists of artists working in a wide range of mediums. Our exhibits will draw from both local and national artists, including both emerging and internationally known figures, working in all mediums. The organization is based on the values of community and creativity. Following these, we will advocate on behalf of Seattle's artists and its arts, and contribute to the Seattle community by offering centrally located affordable studios, educational programs and workshops. ), affordable access to a dark room and other facilities. Wed really be pleased to have you volunteer to help us achieve our goals. Legal Disclaimer : This site and its contents are the sole property of ArtStar Project and contributing artists. You may link to this site if you wish to, but the use of ALL content, including images, requires express written permission from ArtStar Project. Copyright 2008 JHHProductions, All rights reserved.